Each year, the businesses around the West End and surrounding downtown neighborhoods take pride in welcoming Mary Kay patrons. Located only a short three-minute drive from the convention center or a quick ride on the DART’s blue line, the West End is the perfect place to take in the sights and sounds of Downtown Dallas. Whether you are a Dallas resident or are a first time visitor to North Texas, the West End has you covered on places to dine and play in Downtown Dallas. Those are the sentiments of Mary Kay Ash, the founder of Mary Kay Cosmetics. Founded in 1963, Mary Kay has always been a company that has empowered entrepreneurship, leadership education, and recognition amongst women. As a part of the Mary Kay team, women have the opportunity to work with a company that has heart, flexibility, and exponential growth. The theme for the 2016 Mary Kay Seminar is Discover What You Love. And with over 50 years of success as a company and tens of thousands here in Dallas to support and encourage each other, it is clear that one of those loves is Mary Kay! If you are in town for this year’s events, the West End Historic District located in downtown Dallas is jam-packed with many activities to do during your downtime. Visit the Sixth Floor Museum to take in a little history during your stay in Dallas. The Sixth Floor Museum chronicles the assassination of President John F. Kennedy as well as the aftermath and impression it left on the country. Another great place to visit is the Old Red Museum which exhibits the story of Dallas as well as its history and culture. If you’re in for something a little different, go witness the exotic birds, mammals, and fish at the Dallas World Aquarium. With exhibits from places like South Africa, Borneo, and Mundo Maya, it is a must see attraction. When it’s time to eat during your stay, look no further than the West End. No matter the type of food you want, our downtown Dallas restaurants will satisfy your taste buds! Is Mexican more of your fancy? Mosey on down to RJ’s Mexican Cuisine located in the West End. With a happening patio, daily lunch specials, and a happy hour drink menu which includes margaritas frozen or on the rocks, RJ’s Mexican Cuisine is a delicious choice! Serving breakfast, lunch, and dinner, Ellen’s Southern Kitchen is a Dallas must! Nestled in the West End, Ellen’s menu and charm is a staple for people visiting the city or for Dallasites alike. Featuring items like poached eggs & grits, open face meatloaf sandwich, and its fabulous chicken fried steak, it’s no wonder Ellen’s has been deemed as Spoon University’s 30 Best Things to Eat in Dallas Before Your Die. The Annual Mary Kay Seminar is an event we look forward to in the West End! 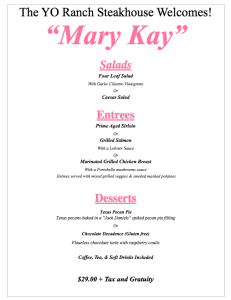 Since the West End neighborhood is a short distance from the Kay Bailey Convention Center, we encourage our Mary Kay guests to stop by to explore the dining and attractions located here. We have enjoyed seeing everyone and hope you are enjoying your stay in Dallas.